What happens when control freak director Alex Brady (Fisher Stevens) is confronted with a problem he can’t direct or FX away? Well, in season eight’s “Murder, Smoke and Shadows,” the answer is an old-fashioned movie backlot electrocution. And, as much as he’d like, no amount of 3-D holographic technology, rear projection or fancy soundstage lighting will deter Columbo from closing in on his current (and past) sins. Abed Gheith returns to the show to discuss the episode, along with possums, Megaforce and so much more. Loved the podcast. My personal opinion is that Fisher Steven’s hair flipping made him a better villain. This was a really fun episode of the podcast! I miss these when you guys take a break! A great episode, though I must admit some parts were difficult where everyone was talking over each other… inevitable in a podcast I know, but after never missing an episode of JOMT to date, this was the first time it was strikingly noticeable. I did come away from this episode feeling I missed a lot of interesting dialogue from you guys, and that’s a first. But please don’t take as a criticism – I love the show and I always come back, so please keep them coming. P.S. I must admit, I recently re-watched the George Wendt episode (‘Strange Bedfellows’), and to my surprise, it wasn’t nearly as unwatchable as I remember! No- I noticed it too, and it was largely (100%) on me and very much noted. I have to take some of the blame for this too — I live in the boonies, and my internet connection is spotty at best. It’s not unusual for there to be as much as a two-second delay in hearing what RJ and our guest are saying, so sometimes I end up talking over the poor folks. I’ve upgraded my router and all that good stuff and it’s better, but it’s still a problem … many apologies for it, it can’t be pleasant to listen to. When I started actively watching Columbo back in ’89 as a 15 year old here in the UK, this was the first one I remember watching. I always knew of the show – must have seen some via osmosis as a kid – but I remember this one well. Not exactly bulletproof logic-wise, but enjoyable all the same. Love how the podcast is coming with alternate ideas for plot, backstory, and other detail. 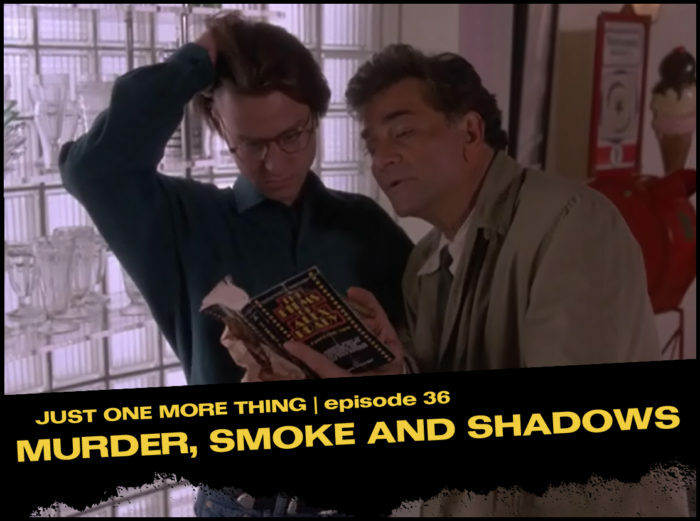 I think this is a great audio-companion to The Columbo Phile book. And the greatest compliment I can pay the show? It’s making me actively want to go through the box set and watch all the ‘second era’ episodes (Murder Of A Rock Star being a particular highpoint, I think). Roll on ‘Candidate For Crime’ – my all time favourite episode. This was where New Columbo started for most people in the UK. Some of the new shows had been on satellite/cable but Murder, Smoke And Shadows was the first one shown on network TV (February 23rd 1991, ITV at 7:40pm if you’re playing the home game). I haven’t listen to the podcast yet, but the one thing that has stayed with me about this episode down these 25 years if a hatred of how Falk says the word “sticky”. You’ve got one of three in my rubric: the beach (but no relatives or Robert Culp). I really appreciate that you have gone to the trouble of describing the episodes in detail for those of us who can’t find it. Re: weird candy bars, my husband is a bit obsessed with weird regional candies and we went to a specialty candy store looking for some and the woman there said that Idaho Spuds were the worst candy bar ever made. Naturally he bought like three of them. Excellent show and a great episode. A small bit of trivia: Steven Hill was also the original leader of the IMF team of Mission: Impossible before Peter Graves. He is also an Orthodox Rabbi and during the holidays, he would gather Shatner and Nimoy for events. Great chemistry gentlemen and looking forward to the next episode! Just received the news that Steven Hill has passed at age 94. He was the best thing about this episode.